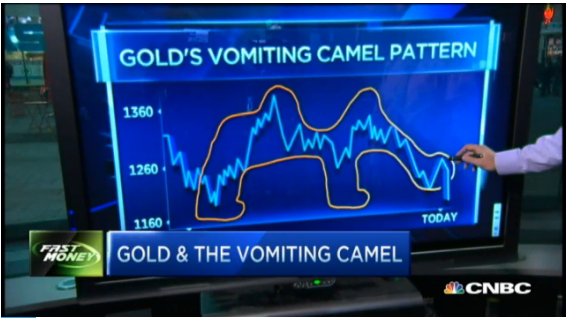 Yesterday on CNBC’s Fast Money program Brian Kelly, tongue in cheek, introduced a “vomiting camel” chart pattern and explained why he feels that after last week’s rout, gold still has much farther to fall. 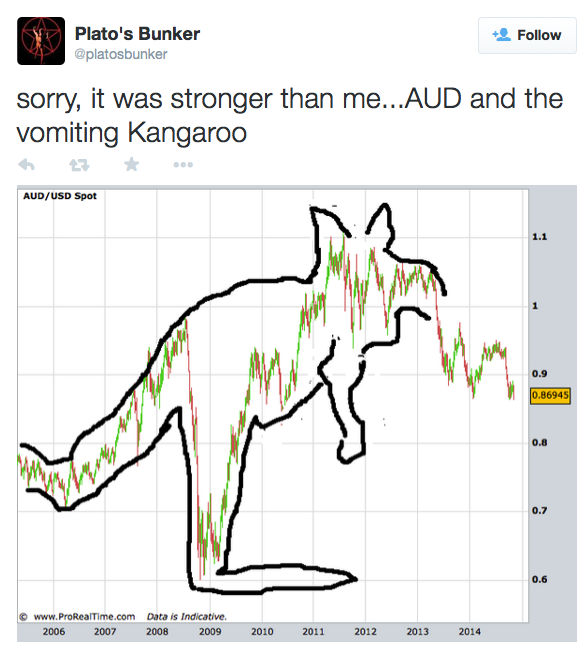 Not to be outdone, last night Plato’s Bunker tweeted a “vomiting kangaroo” which charts the weakening Australian dollar. As you can see, both gold and the Aussie are getting crushed, thanks to a surging US dollar. The greenback now sits at a 4-year high – getting a fresh boost last week from the Bank of Japan’s surprise move to ramp up its already massive bond buying program. At this point, Japan’s central bank is throwing everything except the kitchen sink at its economy to spur growth. 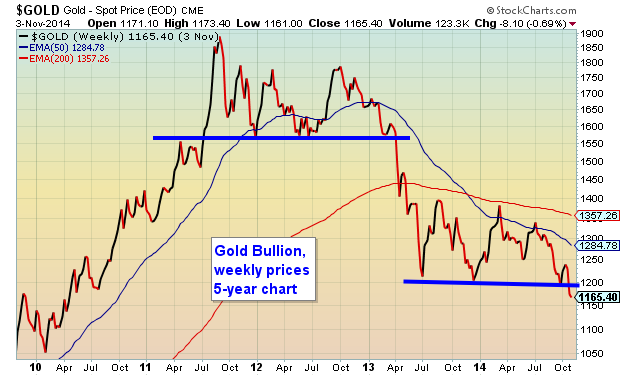 My more traditional (but boring) chart below depicts gold bullion falling through support last week, a level that held prices in check since April. Gold is not for everyone. It’s a commodity with wide, erratic price fluctuations. However, for those who can tolerate volatility, an allocation to gold can help serve as a hedge against inflation, financial crisis and social unrest. 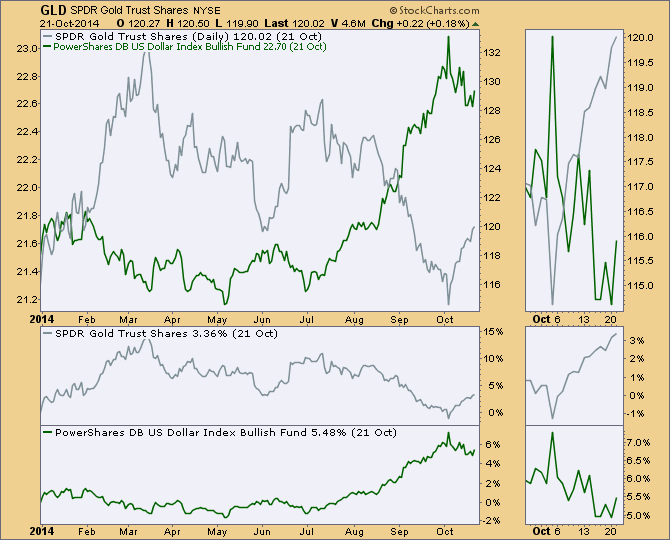 My newsletter’s gold timing model flashed a buy signal yesterday, its first venture back into the metal since July 24. It’s not clear whether GLD’s intermediate-term uptrend will have legs, but the risk-reward level is more favorable now than it’s been in several months. This month marks the 30th anniversary of The Mutual Fund Strategist newsletter’s gold timing model. 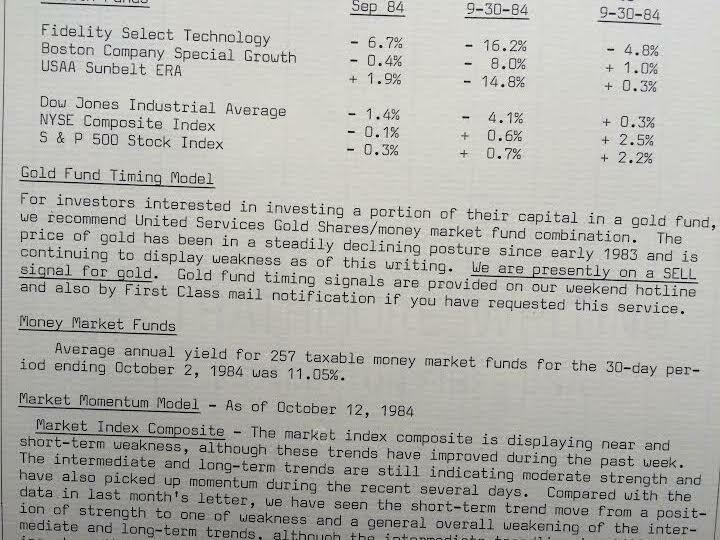 You can see in this archival copy of page 2 of our October 1984 issue that gold started out on a sell signal. Those were the days…. snail mail newsletters, telephone hotlines, and money market funds yielded over 11%!